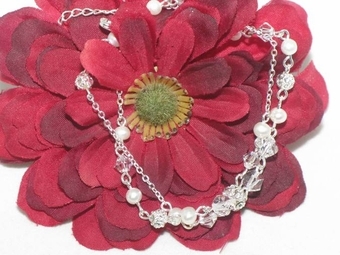 Delicata -Crystal and pearl bridal bracelet - SALE!! HOME / BRIDAL JEWELRY / Wedding Bracelets / Delicata -Crystal and pearl bridal bracelet - SALE!! Description: Stylish and elegant, this silver plated bracelet is the perfect accessory for your wedding, prom, or homecoming. The bracelet features ivory freshwater pearls and clear Swarovski crystals that will coordinate beautifully with your ivory wedding dress. The piece measures 7" long.